Honey had suffered neglect at a local egg and poultry farm. She had been left outside in freezing weather, and had suffered horrifically, as well as endured frostbite to one entire foot and the toe on her second foot. The farmer had been moved to take her inside and give her some care, but told us if we didn’t take her, he would have her slaughtered for meat. Her foot was still attached but totally dead. We knew that birds can live full happy lives despite the loss of a foot, and in her sweet eyes, we could see a bright spark. We picked her up from them and took her into our care; consulted with experts and veterinarians, got her on pain medication… and kind friends stepped up to assist with the costs of her care too! It was intense but we saw her through the four month process of fully recovering which in part meant having to lose her horribly damaged foot. You can see the suffering and neglect so clearly in the “Before” Photos, and the after photos also speak for themselves. Today - a YEAR LATER - she is a beautiful, sweet and thriving soul, able to get around despite the loss of her foot. She has had a year of experiencing warm days in the grass, sun and outdoors, and in winters safely inside enjoying all the comfort, love and care we can provide. How can anyone say this care and rehabilitation is not worth it, when she has been enabled to experience a more compassionate and peaceful life. Honey is someone, not something! She is not an egg factory for anyone: she is a living, breathing innocent and wonderful being we are so grateful to have in our family. When we went to pick up Buckles, rescued in a large group of birds from the annual slaughter ritual that takes place in Brooklyn (and around the world) known as Kapporos, he was in a cardboard box designated as one of the birds who faced extra challenges; he had a really bad limp (could barely stand) due to both a terrible gash to his hock and also a toe cut in half and still infected; it is likely that his leg was caught between plastic crates these birds are transported in. His hip was terribly displaced, as if he had pulled so hard to free his trapped toe, he had sustained permanent injury. He was rescued along with another sweet Cornish bird, Pancakes. Pancakes did not make it despite all efforts - he could not recover from the weeks of abuse and neglect, sickness and horrible conditions they had been forced to endure. But somehow Buckles pulled through - with antibiotics, regular foot soaks, physical therapy, pain medication and all the love we could give. As of Winter 2018 dear Buckles is turning THREE YEARS OLD! We are in awe and grateful to the universe, that this sweet and charismatic boy has seen several years of love, life, friendship and care… and we’ll give him as many days and years filled with those things as we possibly can! Almondine was found wandering in a lightly populated rural neighborhood by kind people who kept their eye on her over the course of two weeks, throughout storms bringing record amounts of rainfall… they were afraid to try to try to catch her, because she was scared and would run away - so they put bits of bird seed out when possible, and posted notices on social media hoping someone would come forward saying they had lost a hen. But no one stepped forward to claim little Almondine. Hens and especially roosters are routinely discarded by people; kicked out to fend for themselves when they don’t lay enough eggs, or people move and commonly abandon these birds; simply leave chickens behind. Or sometimes people just let them free-range, oblivious to the kind of watchful care these non-wild, domesticated beings really need. We saw the social media posts and drove to the area on a day the nice couple were able to be home keeping her in their view. It ended up not being difficult to capture her: she was soaked to the bone and starving and weak. When we put some feed on the ground she stumbled over to it, ravenous - and we scooped her up in a towel to get her to care. 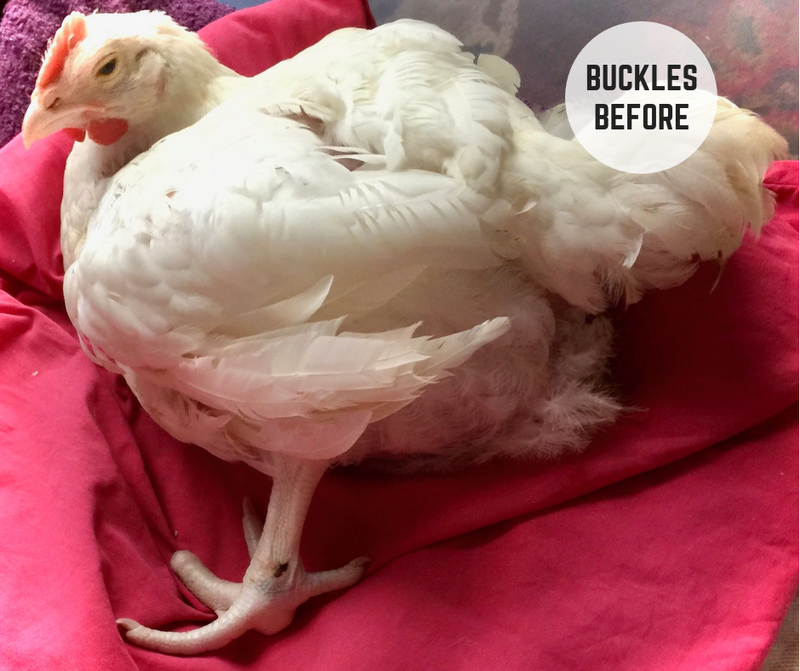 After quarantine time, vetting, treatment for some basic parasites and time to gain strength and health, Almondine was ready to join little Tony Orlando rooster and his flock… but it would take months more for her to re-grow her feathers. Today she is a beautiful and sweet red hen with a healthy feather coat and the most wonderful, friendly and curious disposition!